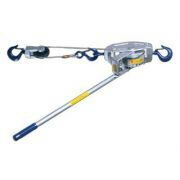 Lug All brand industrial quality winch-hoist with aluminum alloy frame. Cable diameter 1/4" length 22' Min. disctance between hooks 18 1/2"
* Please call us for any questions on our comealong 2 ton blue rentals in Portland OR, Gresham OR, Milwaukee OR, and surrounding metro area.